Welcome to our Obituaries where you can discover what community members have passed and who in your neighborhood could use spiritual and moral support in their time of loss. February 1-- Mr. Melvin Lee “Cotton” Johnson, age 69, of Mt. Vernon, died Thursday, January 31, 2019 at his home, after an extended illness. He was a native of Glenwood and spent most of his life in Mt. Vernon. Cotton was retired as a truck driver, attended Mt. Vernon Church of God, and enjoyed doing mechanic work and fixing hot rods. He was preceded in death by his parents, Robert and Lula Bell Johnson and one brother, Elton Elvis Johnson. Mr. Johnson is survived by his wife of forty-four years, Christine Johnson; one son, Kyle Lynn both of Mt. Vernon; stepchildren, Rodney Calhoun of Mt. Vernon, Davia Calhoun of Atlanta, and Suzanna Calhoun of Mt. Vernon; one sister, Doris Smith of Mt. Vernon; and numerous grandchildren and great-grandchildren. 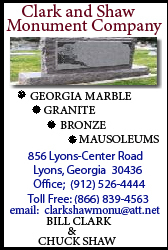 The graveside service will be held Saturday, February 2nd at 1:00 p.m. at Mt. Vernon City Cemetery with Reverend Ray Woods officiating. The family will receive friends at the funeral home on Friday evening from 6:00 until 8:00. Ronald V. Hall Funeral Home of Vidalia is in charge of arrangements.